What does history tell us about who becomes a land-based power or commands the high seas? France rose up to greet me at daybreak one morning in late June,culminating an overnight flight from Boston. (That line was supposed to read, “…following an overnight flight from Providence [a day earlier].” Don’t get me started on airline misadventures.) Ifri, the French Institute of International Relations, graciously invited me across the Atlantic to address a conference on Japan’s defense posture and, later in the week, to lecture on whether China has unfurled a Monroe Doctrine in the South China Sea. Before this trip I some how managed never to alight in France. The country does not disappoint. Indeed, my French sojourn confirmed some acerbic commentary from Captain Alfred Thayer Mahan, Neptune’s Prophet (Henry Stimson’s metaphor,not mine) of blessed memory. Never known for political correctness, Mahan pronounced the French nation unfit to rule the waves—at least in comparison with rival Great Britain. This wasn’t a putdown, or at least not entirely so. He issued this dour verdict in part because the French motherland was such a darned nice place. Think about it. Britons inhabited a resource-poor island. A hard scrabble existence would have confronted them had British seafarers stayed at home rather than venture seaward in quest of overseas trade and prosperity. Frenchmen dwelt in a green and pleasant land. They could provide for their daily needs chiefly from their own resources. Who would willingly leave such a verdant setting behind for the drudgery and perils of Homer’s wine-dark sea? As an economist might say, the incentive structure created by geography, topography, and climate did not bias the French toward seaborne enterprises the way it did Britons. Mahan was a historian with an agenda, namely convincing Americans to take the British path to sea power. Writing a century ago or thereabouts, he fretted that America might never fulfill its maritime destiny because it too was a large, pleasant, resource-rich place. It might turn inward while contenting itself with continental power. That is, it might follow the French pattern. Not every coastal society can remake itself as a world-beating maritime society in the mold of a 17th-century Dutch Republic or an 18th-century Great Britain. In Mahan’s day it remained unclear whether the United States would even make the attempt. Mahan formulated six metrics to evaluate which nations could entertain grand nautical ambitions and which should not. Some attributes were physical and immutable, like the extent of territory and the number and quality of natural harbors. Others were rooted in more fungible traits like history, politics, and national character. This remains a useful yardstick a century hence. It’s a mistake, however, to push the Mahanian analysis too far. In extreme cases physical attributes like geography can be fate. No landlocked country is likely to command the world’s oceans and seas. But such cases are very few and very far between. Let’s not surrender to determinism, the idea that one factor or another predetermines the outcome of a society’s maritime project (or other endeavors). Mahan may be right about the factors that drive nations to the sea. He vouchsafes that the propensity to trade constitutes the chief determinant of sea power. Unlike an island state like Britain or Japan, moreover, a continental state like France has the mixed fortune to adjoin other strong countries. It neglects land defense at its peril. Thus it cannot concentrate its full energies and resources on maritime commerce and naval endeavors. But to conclude that a mainly continental power like France can never reinvent itself as a formidable seagoing power is a bridge too far. A land-turned-sea power can give a maritime hegemon fits, even if it never wrests away command of the oceans. And indeed, French mariners like Admiral Pierre André de Suffren de Saint Tropez once gave Britain a run for its money. Mahan heaps praise on Suffren’s “unyielding energy and genius.” The intrepid French commander took the fight to the Royal Navy in the Indian Ocean during the War of American Independence—helping expand a local conflict in North America far beyond the original zone of combat. Horizontal escalation stretched British resources thin, letting the Franco-American alliance prevail over the predominant sea power of the day. Nor is the nature of the regime all-important. While liberal trading societies have historically fared the best on the high seas, autocratic nations can construct great navies. Mahan himself recalled that a “despotic power”—he had Louis XIV’s France in mind—could build afleet with greater dispatch than could a liberal society whose governing arrangements kept it from directing and redirecting resources with the ease of a Sun King. Mahan doubted a land power that turned seaward could command the sea in any lasting fashion. That’s different from insisting that a France can never accomplish modest goals on the high seas. It can, and it has—even when opposed by the strongest seafaring state of the age. So could other land powers that aspire to sea power. My lecture in Paris took place on July 4, which of course is Independence Day for Americans. It was fitting, consequently, to remember the feats of French seamen in our Revolution. So I did. Suffren worked his strategic wizardry far away. By contrast, Lieutenant Général des Armées Navales François-Joseph Paul, better known as the Comte de Grasse, did so just offshore. De Grasse commanded a fleet that bottled up Lord Cornwallis’s army at Yorktown, near the mouth of the Chesapeake Bay, in 1781. 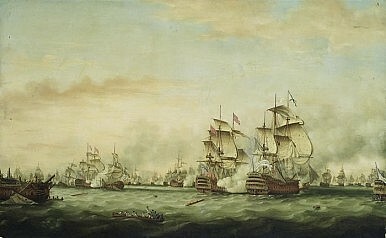 Though inconclusive, the ensuing fleet battle kept the Royal Navy from resupplying the bedraggled British force. Cornwallis capitulated to an army led by George Washington and another Frenchman, the Marquis de Lafayette. By winning temporary local control of the Chesapeake—a rather modest feat of arms—de Grasse sealed the fate of British rule over North America. (He also lost his fleet in a Caribbean battle a year later. But that, as they say, is a story for another day.) The bottom line is that even a preeminent sea power that mismanages its affairs can lose out to a lesser but more astute and determined competitor. The weak can win.That’s a lesson of French history worth remembering as the United States girds itself for strategic competition with China—another autocratic land power bidding for sea power. Does China have a Suffren or de Grasse? James Holmes is an associate professor of strategy at the U.S. Naval War College. The views voiced here are his alone. Is China Bidding for the Heartland? Beijing doesn’t have to choose between land and sea predominance. It could have both.